One of the few units necessary to activate 4th attackers in Aqua Force, Basil is a card that needs to bring a lot to the table to really be of use to you, and it does a great job at it. First to mention are some of the flaws of the card. Against 11K and bigger Vanguards, Basil’s not hitting. Without any outside power bumps or such, Basil’s 10K attack power and requirement to attack the opponent’s Vanguard means that it will have trouble hitting some of the many +11K Vanguards popping up in the metagame, and ultimately making you lose 5K power from your power rush. Remember how Maelstrom’s ideal field can set up to force out 45K shield in the form of 6 cards per turn (said ideal field incorporates a Storm Rider)? This is actually extremely similar to the minimum amount to guard out most other ideal fields in other decks. 20K shield and 2 cards against a Vanguard attack, 10K shield and 1 card for a normal column, and 15K shield and 2 cards against a +20K column, for a total of 45K shield in the form of at least 5 cards. Due to how triggers work, this curves up just slightly to a 48.3K shield, 5.7 card average. Losing Basil to this however has just dropped Maelstrom’s attack force to only 40K shield in the form of 5 cards, beginning to lag behind compared to other decks of the metagame. And because over half of the attack force’s power rests in Maelstrom, Perfect Guards are already detrimental to your ability to force out the opponent’s guard, meaning that every single loss in your Rear-Guard lanes is painful in the long run, unless you want to run on a deck whose output is far less than most anything else in the metagame. Of course, this assumes 2 things. Firstly that you must use Basil unboosted, which further assumes you are setting up a 4th attack Vanguard or such like Maelstrom. If you’re using something like, say, Naval Gazer Dragon, you can instead abuse that Basil is virtually another 10K attacker you can use to build your forces. Instead of having to worry too badly about building the proper field out of limited resources, Basil can essentially allow you up to 8 10K attackers in your deck to help you quickly build up your field. Basil has one other use too. While in the late game, its best potential is to force an opponent to split up a 10K shield they could’ve guarded a column out into possibly 2 5K shields while Basil is in play, its role in the early game is invaluable to you as well. Most deck ratios, well, at least most normal deck ratios generally center themselves really close to a 14-11-8 of a Grade 1 to 2 to 3 ratio. Including that you lose a Grade 1 and a Grade 2 to the soul in the course of riding, this leaves about 13 boosters in your deck to 18 beaters. After considering that a good deck should be running 4 Perfect Guards and most people can’t really get rid of those in the face of the evolving meta, and that further drops the ratio to 9 boosters to 18 beaters. With Basil, you could literally triple your options of units to call, along with making amazing use of excess beaters in your hand, something that will happen with that sort of ratio. If the opponent has a 10K Vanguard, or less if it’s actually that early in a fight, you can focus your 9 boosters to your other Rear-Guard and Vanguard lanes, while you drop an excess beater behind Basil, maximizing the output of your field right away and actually making that sort of job of properly scaling your field just right that much easier on you. Also including that 4 attacks instead of the usual 3 can accelerate the amount of damage you can do, and you can easily take control of the early game right away through the use of this card. Now as a support card, the actual value of Basil shifts within the builds it could be used in. Overall however, I’d give Basil a solid 4/5. While it has its flaws, Basil is definitely one of those cards with potential that you can very well make use of. For those that don't know, Storm Rider, Basil is definitely one of the trickier cards to get at this moment, but the main question is, "Is it worth it?". My answer, believe it or not, is no; at least not as much as Diamantes...which will be reviewed soon. The thing is that while Basil is alright, the thing is that Diamantes does what Basil does, but better. Granted, Basil can intercept, but that's really it that differs between him and his elder brother. With that said, Basil does do the one thing that needs to be done to help fulfill Hydro Hurricane and Maelstrom's skills and that's to help make room for the necessary 4 attacks. However, it's own strength is its biggest weakness especially for Basil because while Basil can intercept, how can it while its just squatting in the back-row? The answer: it can't. In short, Basil does help get the job done by swinging in at 10,000 for attack one, but why do that when you can swing in for 11,000 on attack one and actually make room for an interceptor? Exactly. Rating: 2.5/5. Definitely not worth it's current price tag. Next time: "Basil, lil brother, allow me to show you how it's done!". Basil represents the storm rider series of Aqua Force units. Common to each storm rider is the column swapping ability that allows the number of attacks to reach four by the time the vanguard attacks. Basil weighs in at a standard/ sub-standard 8k for a grade 2, but boosts himself to 10k if he attacks first, and is attacking the vanguard. Once his attack is completed, hitting or not, he can exchange position with the unit behind him in his column. 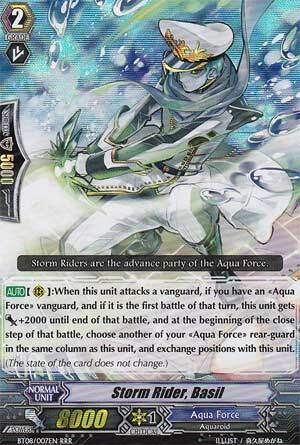 As you can probably tell, storm riders like Basil are essential to the Aqua Force strategy, as many of the more powerful Aqua Force skills are only active when or after the fourth attack has been declared (ie. Maelstrom, Algos, Valeria). Basil’s biggest downfall is that he can only ever hit 10k, since boosting him would defeat the whole purpose of running him. In a metagame loaded with 11-13k vanguards, Basil will often not be hitting once a grade 3 has been ridden, but will only be increasing the number of attacks. After grade 3, you will generally want to replace Basil with the higher hitting storm rider Diamantes, if you can. This does not make Basil bad by any stretch, however, as, with the right setup, he allows a fourth attack at grade 2. This allows you to threaten pluses with units like Tear Knight Valeria and Algos earlier in the game. Basil is definitely worth running in any Aqua Force deck, but where his usefulness is limited to the midgame, a full compliment is probably not a good idea. Rating: 4/5 – Not as useful after riding grade 3 on both sides.